"Birches at White Lake in Autumn"
White Lake in New Hampshire is beautiful. It has a completely white sand bottom from one end to the other formed by a glacier long ago, and the water is crystal clear. 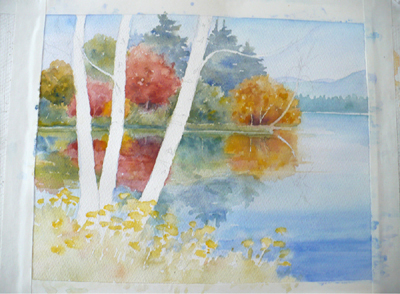 The lake inspired this painting of birch trees in autumn. But there is a lot of imagination sprinkled throughout, so hunt though you might, you will not find this exact spot! I hope you like it nonetheless. 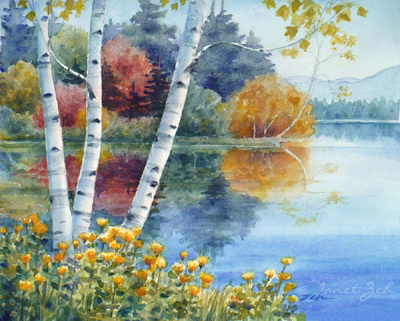 This peaceful scene is entitled "Birches at White Lake in Autumn." The original painting is sold, but you can ask me to paint a similar scene or make a print for you and I'll be happy to help. You can find more of my original landscape and tree paintings in my Original Art Shop. My birch tree prints can be found in Zeh Original Art Print Shop here. Thanks for stopping by!